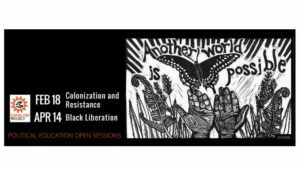 Join us to hear three community leaders share about their work and about how we can actively support projects building Black Liberation in Appalachia, Haiti and the Bay Area. Ash-Lee Woodard Henderson, Co-Executive Director of Highlander Center, a beloved radical movement center dedicated to developing grassroots leaders in Appalachia and the South. Pierre Labossiere, co-founder of Haiti Action Committee, is one of the most respected voices on the Haitian grassroots struggle for liberation and self-determination. Kamau Walton, Communications Associate at the Transgender, Gender-variant & Intersex Justice Project (TGIJP), is a local leader in movements to abolish imprisonment and policing and build community self-determination. Please email us at accessibility@collectiveliberation.org by Tuesday, April 10th, to request ASL interpretation, language translation, or with other access needs. This will be a reduced-scent space and there will be fragrance-free seating area. Please join us in ensuring accessibility for beloved community members with chemical injuries and chronic illness by not bringing fragrances or scents on your clothes, hair, or skin from colognes and perfumes, scented laundry detergent, hair and body products, “natural” products, and essential oils. Please prepare in advance by not using products with fragrance, or by using fragrance-free, non-toxic products. For more info on what this means, visithere. Ash-Lee Woodard Henderson is a 32 year old, Affrilachian (Black Appalachian), working class woman, born and raised in Southeast Tennessee. She is the co-executive director of the Highlander Research & Education Center in New Market, TN, the first Black woman to serve in that position. She has served in positions of leadership for many organizations including being the past president of the Black Affairs Association at East Tennessee State University and the Rho Upsilon Chapter of Delta Sigma Theta Sorority, Inc. She holds a B.A. in English with a minor in African and African American History. She has extensive experience with community organizing and is a former staff member of the Chicago SNCC (Student Nonviolent Coordinating Committee) History Project, and a past member of the United Students Against Sweatshops National Coordinating, Political Education and Collective Liberation Committees. Pierre Labossiere is a Co-Founder of the Haiti Action Committee (HAC), a Bay Area-based network of activists who have supported the Haitian struggle for democracy since 1991. Members foster extensive contacts with the grassroots movement in Haiti and work to promote international solidarity. He was born in Haiti and has been active in the struggle for justice since his teen years. Pierre also co-founded the Bay Area Haitian-American Council (BAHACO) in 1990 to disseminate information about Haiti and seek support for community-based initiatives and other emerging institutions engaged in rebuilding the country. He is a Board member of Global Exchange, the Haiti Emergency Relief Fund and Ecumenical Peace Institute.